Put everything in a slow cooker, stir to cover chicken and cook on low for about 4 hours, high for about 2 hours, or until the chicken is cooked through and tender enough to shred easily with two forks. Shred chicken with two forks until finely shredded and stir in all the surrounding sauce. Take your time shredding because the more you shred, the more sandwiches you can make throughout the week! Store in the fridge. In a large bowl, add vinegar and a dollop of mayo and mustard to the carrots and cabbage. Mix until combined, salt and pepper, and then taste. If you want a creamier slaw, add another dollop of mayo. If you want a tangy, healthier slaw, add another dollop of mustard and maybe even a little more vinegar. If you want both, add both! Always start with a small amount of each and add until you are happy. Store tightly covered in the fridge for the week. Boil a large pot of salted water over high heat and add the potatoes and sweet potatoes. Cook until very soft and mashable. Drain away most of the water, mash with pepper paste and butter until very fluffy and smooth. Salt and pepper to taste. Set aside. Preheat oven to 400. Heat olive oil in a large skillet over medium heat. Add onion and cook until tender and translucent. Add all peppers, mushrooms and garlic. Add a couple sprinkles of salt. Cook until tender, about 7 minutes. Sprinkle with flour and cook another 1 to 2 minutes. Add beans, corn, cocoa powder, chili powder and cumin. Stir to combine, salt and pepper to taste. Punch up the taste and heat with hot sauce. Cook until the juice around everything starts to thicken a bit. 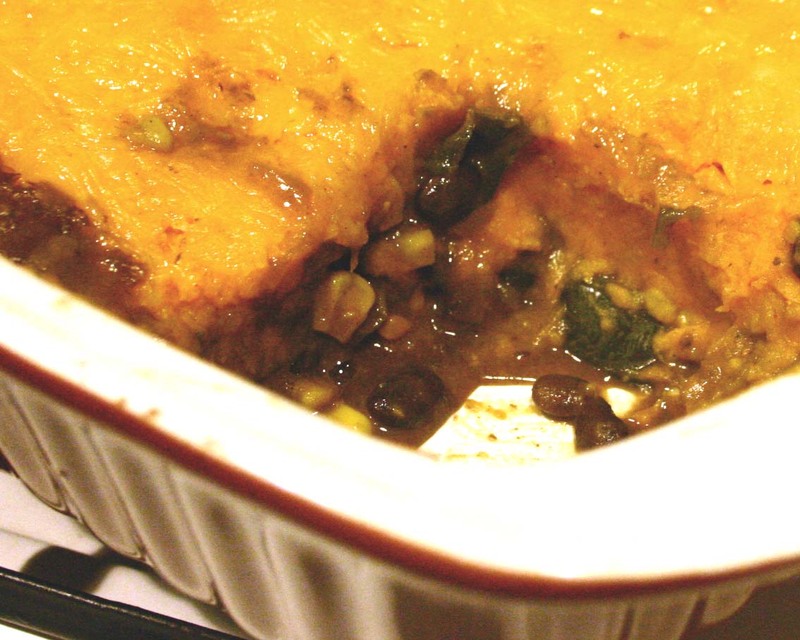 Pour into a casserole dish. Top with the potato mixture. Top that with the shredded cheese. Bake until the cheese is bubbling and just starting to brown. Store covered in the fridge for the week. In a small saucepan, bring the water to boiling over high heat. 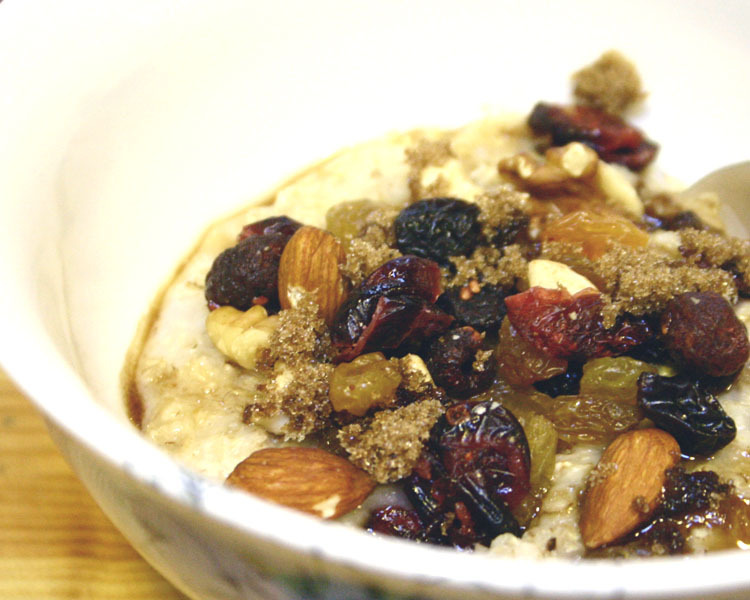 Reduce heat to medium high and add the oatmeal. Stir constantly until cooked, about 3 minutes. Don’t let it get gloopy, just thick :-). Divide between two bowls, add brown sugar and trail mix. If it is too thick, add a little soy milk or milk to loosen it up. 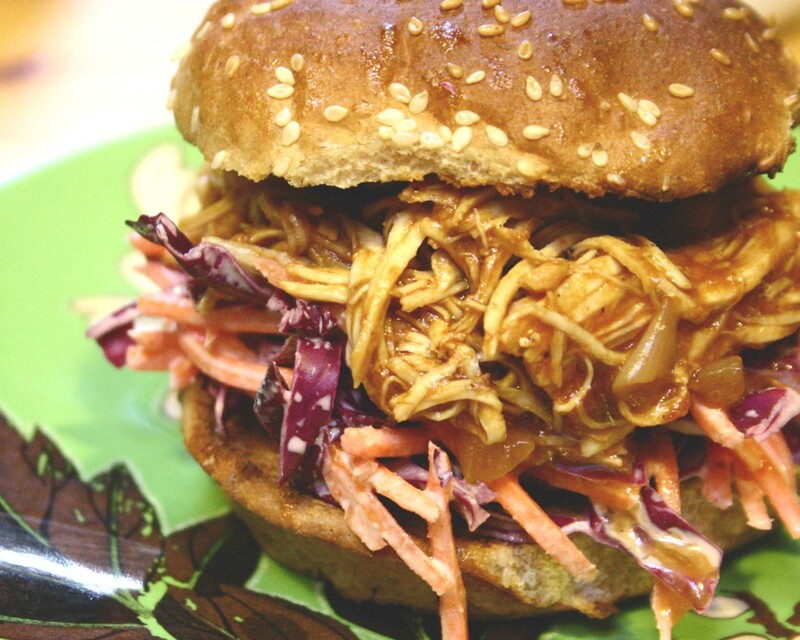 Top the bottoms of the buns with reheated chicken, then slaw, and then the bun tops. Chow down! Preheat oven to 400. Bake 2 portions of the pie in a small casserole or individual ramekins until bubbling and hot. Alternatively, you can heat the pie portions in the microwave and then broil in the oven quickly to brown the cheese a bit.